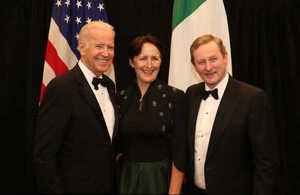 From top: Taoiseach Enda Kenny with US Vice President Joe Biden and actress Fiona Shaw and at the Kennedy Centre for the ‘Ireland 100’. 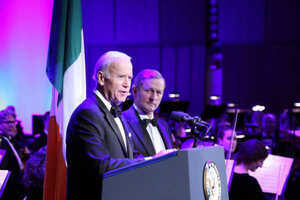 The sense of event was heightened by the presence of Vice President Biden and the taoiseach of Ireland, Enda Kenny, which meant the accompanying presence of airport-style security gates that kept the glittering audience waiting in line for minutes after the scheduled 8 o’clock start. We all wish that our government leaders would come to more arts events, but when they do it is certainly a hassle for everybody. Fiona Shaw, the actress, was a buoyant master of ceremonies who was as natural and unaffected as it may be possible to be in an evening skirt, trying to keep a touch of class in this high-end variety show and then marshaling her own talents for a recitation of Yeats’s famous “Easter, 1916” (“A terrible beauty is born”) that was unquestionably the artistic highlight of the evening…. 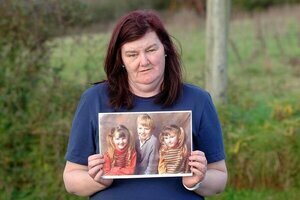 Posted in Misc and tagged Enda Kenny, fiona shaw, Washington at 2:05 pm on May 19, 2016 by Broadsheet. 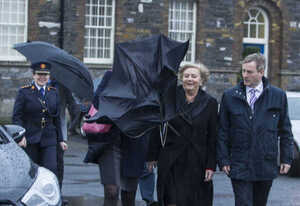 Enda has no problem using the Arts for political & diplomatic reasons but abolished the department that invested so much in it. Hypocrite. Everything the guy does is for show, theres no substance to him at all. Bodger, you need to fix the images and/or the captions, they don’t align. Doffing the cap to the real masters. He would have been taken aside as the start of his first term and told who the real boss is. Paddy licking Uncle Sams boots as usual. No wonder Americans think this is some sort of quaint medieval backwater (assuming they can find it on the map that is). I hear Biden is coming here to trace his roots? Better make sure he doesn’t overstay his visa. What good has this fabled “access” done for the country?